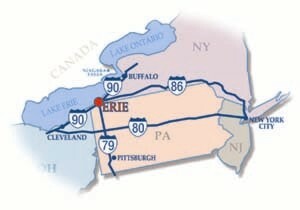 Erie's Bayfront Convention Center has easy access to the Erie International Airport and interstates 90 and 79. Erie is a short drive from Pittsburgh, Buffalo and Cleveland and only a half-day’s drive from Detroit, Harrisburg, Pa., and Rochester, N.Y.
United, Delta, and American Airways serve Erie International Airport/Tom Ridge Field. Direct flights from Chicago, Detroit, and Philadelphia are available. Rental cars and taxi service are available. Greyhound connections are available to and from Erie. Call Greyhound at 800-231-2222 or 814-453-2171. The bus station is approximately fifteen minutes from campus. Taxi service is available.